When we moved, I unearthed a box of old stuff from my childhood that I haven't looked at in years. There were a lot of old drawings and books I made from when I was ages 5 to 8. 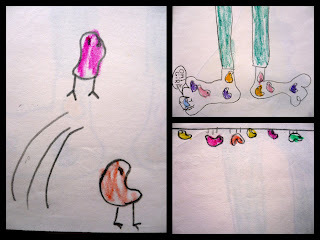 I had a good laugh at some of the crazy things I drew as a little kid, so I thought I'd share some OLD art today. Here we have a squirrel complete with bushy tail, bucked teeth and what appears to be an acorn in its paw. A set of random drawings. 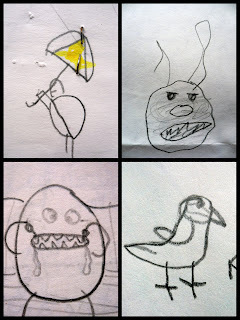 The first one looks like a turtle with a yellow umbrella, then an angry bunny or something, an oval making a stupid face, then I'm guessing a picture of my childhood budgie. Aaaaaaand in case you needed a reminder, there were no dinosaurs in 1993. Haha, I hope you enjoyed these! I love looking at little kid's drawings, so if you have any that you did as a kid, or your kids did, please oh please do a post like this. Comment and leave a link to it, because I'd love to see some hilarious/adorable kid art! So cute! My kids at work have drawn some hilarious things for me, and are not drawing yetis for me. I will scan some and post it! p.s. I'm giving away an Anthropologie scarf - check out the post on my blog to enter, it ends tomorrow @ midnight! Good luck. oooo, what a great idea! I might look through some of my old art!!! my dad has boxes of it!! OMG, i freakin love these!! I can't decide which one I like more- angry bunny or no dinos! ps. I'm posting my 7 things today! I especially love the dino one. It is soo true.